In the mid 13th century, the manor of Newton-by-the-sea was part of the barony of Vesci, which was "held by John Viscount for one knight's fee", Ownership of Newton passed to Simon de Montfort then to Edmund of Lancaster, Sir Lawrence de St Maur, and so on through the centuries. In 1725 the township, one of the ten constituting the Barony of Embleton, was divided, with part of it owned by several generations of the Forster family. Newton Hall is a late 18th century house built for Joseph Forster. Low Newton (also called Newton Seahouses) was built in the early 19th century as fishermen's cottages, the gabled dormer windows being added in the mid 19th century. Some of these cottages are now owned by the National Trust. The Coastguard Station was built on top of the hill about 1828. Census returns show a population of around 250 in Newton during the 19th century. The Northumberland County History, published in 1895, records that "Newton- by-the-sea is a township containing 1211 acres and a population of 220 persons". Today, the population is a mix of residents, people with holiday homes, and visitors. The majority of residents travel out of the village to work, to nearby towns or to the Newcastle area. 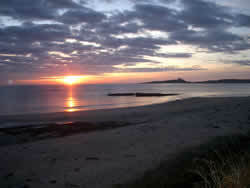 The National Trust owns much of the coastal land in the area, and also part of The Square at Low Newton.